I was going to describe this tool as 'life-saving' but that would be a clear exaggeration. However, I have no doubt that this has forever changed how I organise my to-do list for the better. As a teacher, the list of jobs is neverending: the planning, teaching and marking, cutting, laminating and making, letters, reports and e-mails to write, tests to deliver, mark and analyse, all before you consider the bureaucracy and paper trail to be accountable to others. I have always been a fan of to-do lists. I started out having a book; it was never in the right place at the right time. Next, inspired by something I'd seen Michelle Mone (creator of Ultimo) do, I turned to post-it notes. I would stick them all over my desk and carry a small pack with me. This turned out to be tricky if my outfit didn't have pockets and my desk was totally covered in post-its. I was then given a to-do list notepad similar to this as a present. This worked better as I could use different sheets for different sorts of jobs. However it was always in the wrong place when I needed it. As part of some work with a parent-governor, I was introduced to the free online tool which changed how I organise myself: Trello. 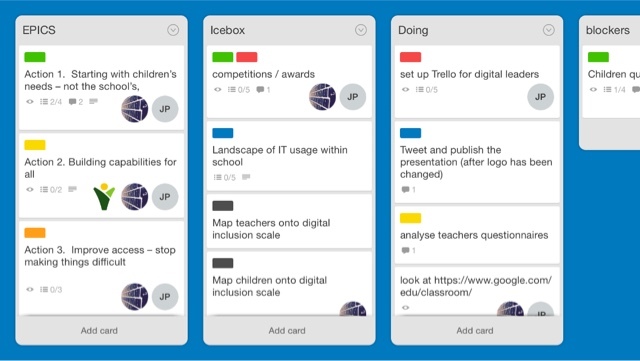 Trello advertises itself as "a collaboration tool that organizes your projects into boards. 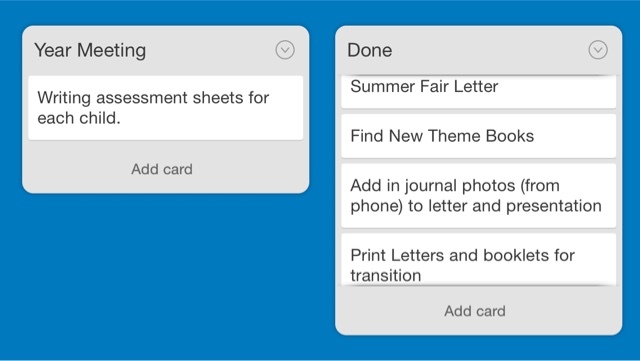 In one glance, Trello tells you what's being worked on, who's working on what, and where something is in a process." The main thing that has made Trello such a life-changing tool is that I can access it wherever I am across an array of devices and it's completely free. I have the app on my iPhone and iPad but often login through browsers on my school and home PCs. 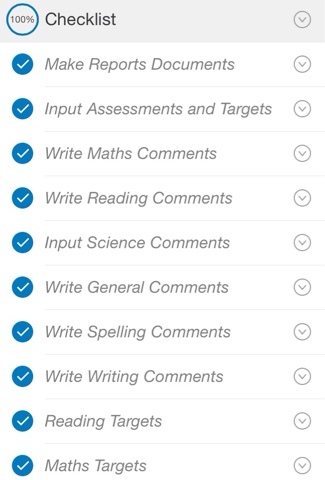 As I record and complete tasks, the tool synchronises across all the devices. I started off with one board, my school board, which is still my most-used. Since then, I have added other boards to organise different parts of my life. Throughout the year, I have generally had three lists on my main board but in the last few weeks of term I have needed to add in a list for next year. You can see my four lists below. Whenever I access Trello, my lists are displayed as below and I can drag and drop the cards between the lists. My 'Done' list is incredibly long but I like to keep it that way to remember the hundreds of jobs that I've completed. As a year leader, I use the 'Year Meeting' list to record things I must discuss with my team when we meet. 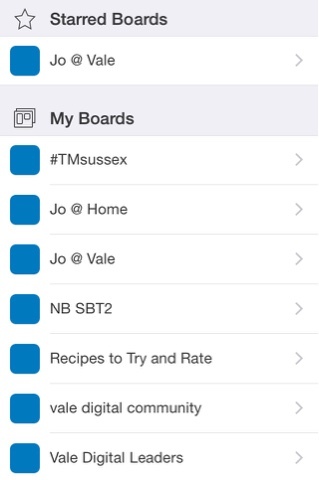 Trello can do lots of amazing things which I don't use, particularly for collaboration. 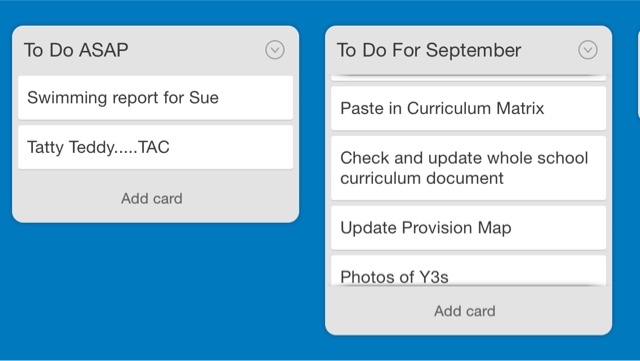 One option which I do make good use of is adding Checklists within the cards. When you click to expand the checklists, you can see the individual steps to completing that job and can check those off individually. 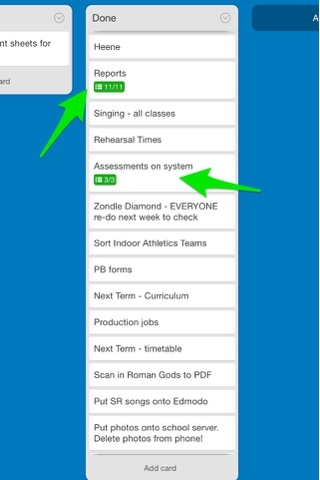 On the boards, Trello then shows you how far through completing the checklist you are. Mostly, I use Trello for myself to keep up-to-date. I have also had some experience in using Trello collaboratively, including with Digital Leaders. In doing this, I've found that you can colour-code jobs, add comments, invite people via emails and include stickers, links and images. When a PGCE student who I mentored needed to complete some activities for university, I set up a Trello board so that we both could track his progress towards completing the work. 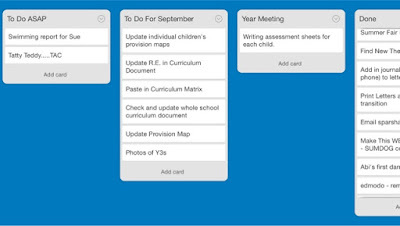 I am sure there is much more Trello can do for collaborative projects but, for me, it does exactly what I need to organise my very busy teacher to-do list. In Tesco recently, a parent spotted me and asked about something to do with school. Immediately, I could put it into Trello on my phone and not think about it until I was ready to do some work when previously I would have had to remember it for a long time!